Fleas are the most common pests that cats and dogs encounter. These blood-sucking parasites thrive in the warm summer weather of Coffs Harbour. They live in yards, homes and on our pets. Although partial to cats and dogs, fleas also bite humans. 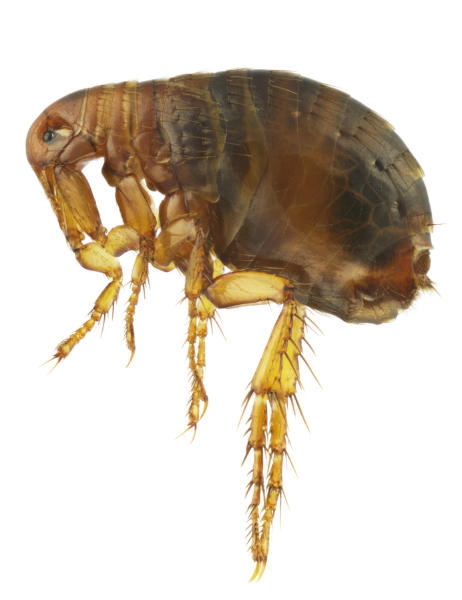 Fleas have large hind legs which allow them to jump on to their hosts. Their hairy legs and bodies allow them to cling to an animal's fur. The flea's diet consists entirely of blood. When a flea bites an animal, it's saliva causes irritation and itching. A female flea can lay up to 50 eggs a day, which fall off the animal and into locations like your carpet. Flea faeces, also called flea dirt, is essentially dried blood, which also falls into the carpet. Within a few days the eggs hatch into larvae and these grub-like creatures eat the flea dirt and any hair and skin it can find. After a week it spins a cacoon in which it pupates, emerging as an adult flea. The vicious cycle continues. Prior to a flea treatment by Admiral Pest Control - Coffs Harbour, you'll need to pick up any loose items off the floor and thoroughly vacuum to remove some of the fleas, their flea dirt and animal hair. It will also encourage pupating fleas to hatch. At the time of treatment you will need to treat all your pets with a quality product, preferably a different brand than you have been using in case they have developed resistance to your treatment.